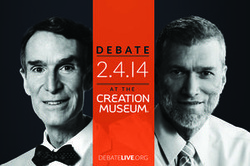 Response to debate - Genesis Alive! After watching the Ham/Nye debate last evening, many thoughts came to mind recalling my past when I embraced evolution and the Sagan/Nye humanistic worldview. I remember the happy promises and exciting challenges that supposedly lay ahead for us as Nye promised last night, we youth not to be so foolish to be bound by the backward beliefs of the church and Bible with their do's and don'ts. This was the broken record replay of the seventies I mused watching Nye, follow me and find the real truths, unshackled by the Bible and its constraints. It was obvious to anyone with a brain "science" had proved them wrong and the Cosmos right. The Cosmos was all there was and man the Master, there being no need of God and besides, the other side is narrow and uncreative as Bill asserted, join them and you will go nowhere but Sunday school class. Wow! Then he takes it to another level, you're actually unamerican to follow such foolishness, doing a disservice to your country! What unknowing young intellect wouldn't follow that offer? It's appealing to have this intellectual power over faith, no need of the Opiate of the Masses, Nye the piper tooting the same tune again. Back then we eventually we found out differently. There were lots of things in life that couldn’t be handled on your own intellectually, like relationships for instance. What set of rules guides us, or do you make them up as you go along? Moral values were impacted also, who decides what's right or wrong?, how can we coexist if you have your rules and I have mine? How can a relationship or a marriage work without boundaries? Where do you draw the line if both people have different goals and/or guiding principals? What was the need of marriage itself, and why do all humans deeply desire this relationship? Did chimps invent it? No!, don’t imitate them, they are godless cannibals who leave their dead to rot! Many in my generation failed in marriage, including my parents, a happy start and heartbreaking end, resulting in ruined lives turning to drugs and alcohol to cope, only to make matters worse. Then I looked back at the older generation - many of these folk seemed happier than ever; content, prosperous, peaceful and attending church like nothing had ever happened! Man, I thought, that looks good, what do they have that I don't? Not a one of them would say "Star Stuff" does it I will tell you. Then I though to myself, something's completely out of whack here, how can this mess get straitened out? this new paradigm is not working at all! Then one night on a flight gone wrong I got my answer. Staring death in the face I took a chance and gambled, "what the heck" I told myself, I've got nothing to loose, this whole idea of star stuff won't get me out of this mess, so I did the unthinkable, I prayed - "If there's a God, I need your help now!". Being out of fuel, engine failing, no visibility and without a shred of hope to survive, I had seen this played out many times in the Alaskan Bush, this is how you die, this is how so many of my friends died, and maybe it's my turn now. Then right back this voice speaks and says this, - "Son, you said the right thing!" More than a little surprised I thought, "Well that worked! ", so how about some avgas while you're at it! Within a few minutes I broke out of the snowstorm, my engine running better and then hope against hope there it was, the beautiful lights of Kotzebue sparkling on horizon in front me. "OK", this is good I thought, only 20 miles to go, over the Arctic Ocean. Once on the ground I was a changed boy I can tell you. My well honed worldview was transformed right then and there. Who was this guy who spoke to me? I won't stop till I find out I decided, and within a few months I was led straight to the Bible, reading it cover to cover. Later as the result of another wreck and my life spared, I took the next step sitting in the back seat of the bush aircraft flying me out, accepting Jesus Christ plus the entire Bible coming along with the deal. I will say I felt myself crossing over from death to life right then and there. As a mechanic also I knew every type of helicopter comes with a set of manuals you see, do as it says and you come home alive, defy It and nine times out of ten you’re a dead man, had seen that in living color more times than I will admit. So life comes with a manual too, never forget that, once you've seen what happens to people in those wrecks you'll get the picture fast. The manual for people is the Bible, plain and simple. The System and the Bill Nye's of the world have lied to us, and that’s why I engage in this arena of thought. They are wrong. I should note that during the debate, Mr. Nye repeatedly ask Mr. Ham "If I showed you absolute scientific evidence that the earth was old and the Bible as you understand it wrong, would you believe it" Mr. Ham's answer, no! What wasn't said is that the Nye side has changed the age of the earth upwards of 5 times in my lifetime, and the Bible has never changed. On the flip side, every year proponents on the young earth side gather more and more uniform evidence supporting their position. Further, a number of the most coveted long-age dating chronometers have come under serious scrutiny, calling into question their usefulness. I recall going through this motion with my profs on college geology class, as they made a project out of me. Guess what, they both became catastrophist's and never once mentioned isotope dating in class again! After that decision, life started changing for me. I had peace and a new understanding of all kinds of things; work, relationships, the earth, animal life and the Universe as a whole. I was not shackled as Nye claimed, I was set free! Answers to my doubts and questions began flowing in, the Bible's framework making far more sense than the humanistic version of origin's. We are not alone I found, the more I prayed the more I received answers, not in material things but in things that really matter. I married a women that understood the same rules and boundaries as I, and it works, just like following the instructions for the helicopters you see, because the manufacturer always knows best. After 6 great children and 37 years of marriage, we have made it all work out, thanks to God. The deal is this; we have a Creator and He makes the rules, not man. He Created the Universe and all life, and every day I search this out the more it's confirmed. And by the way Bill Nye, my children are fulfilled, happy and creative, so you got that wrong also. As for me, check my patent log. Bill Nye, your worldview is without form and void; it's a complete failure and worse, it wrecks lives.